Really bad title I know, but that was my morning and I’m thinking of the song Bloody Sunday. It was 5 minutes before we needed to leave the house to take Princess to school. I told her to put her shoes on, but of course there is something else she has to do first. Blow her nose. She is in the bathroom blowing her nose and she begins to scream, “Help Mommy there’s blood in my nose”. She is over the top dramatic, so I expected to find a speck of blood when I walked into the bathroom. NO, there was blood running down her shirt, and on the floor along with a bloody tissue that she was holding to her nose. AHHH. It took several tissues and lots of wining, but I finally got it to stop…. Then had to RUN to get her shoes on and barley make it to school on time. there's a story on my blog about my son, age 3, who cried out one day "mommy, I RED, *I* RED!!! "...and I thought he'd gotten into markers or crayons...turned out he'd had a bloody nose! EEEEK! Poor kids...those are the WORST! You can explain a cold (germs etc), but how do you explain why a nose will bleed (other than the obvious STOP PICKING YOUR NOSE!). 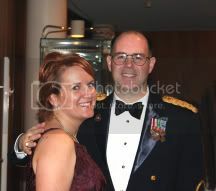 Found your blog through entrecard, and I always support military spouses, especially SAHM's! I'm one too! Come and visit my blog sometime...I'll be adding you to my RSS feed, and eventually to my military blogs! My kids were world champion nose bleeders, especially my son; all you had to do was look at him and he'd start gushing. The carpet in his bedroom looked like we'd committed a murder in there. I finally had both kids' noses cauterized a couple years ago, which solved the problem mostly, although they still have the occasional gusher. Found you through Entrecard, my new hobby.